DETROIT — The UAW is increasing its efforts to persuade General Motors not to end production at four U.S. plants in 2019. The union this week released two videos on social media, with promises of more videos and other efforts on the way, according to UAW spokesman Brian Rothenberg. "The UAW has said we are not going to leave any stone unturned," he said on Tuesday. "It's ongoing and will continue." 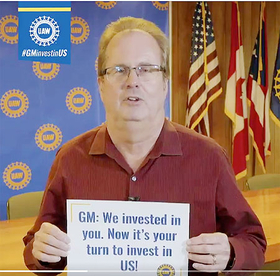 While the union has protested GM in public, launched a letter writing campaign and previously released similar videos in response to the automaker's plans, the ones this week are more clean-cut and targeted. The first features union leaders, including UAW President Gary Jones and the union's vice presidents, discussing the UAW's support for the automaker during its 2009 bankruptcy. They all hold up signs that read: "GM: We invested in you. Now it's your turn to invest in US." While the first video attempts to pull at emotional heart strings, the second is far more aggressive and targeted — characterizing GM's recent decisions as greedy and unnecessary. It compares GM's expected production in Mexico and the United States against Ford Motor Co.'s through 2020. 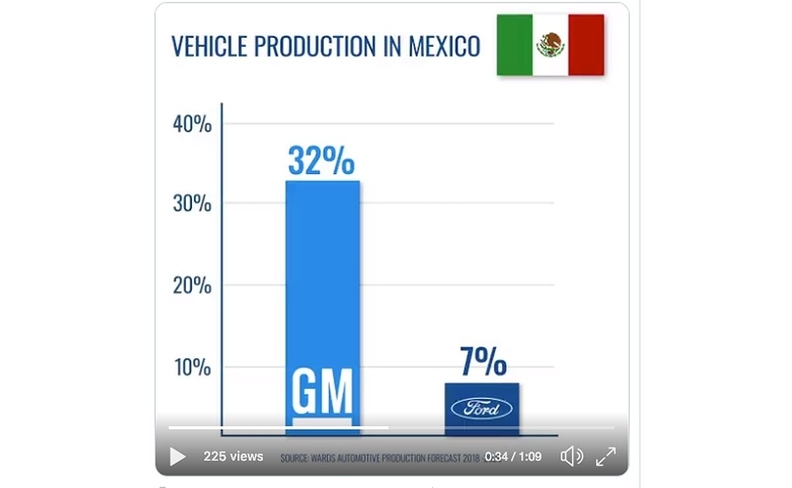 Citing WardsAuto production forecast data, the video states 32 per cent of GM's North American production will come from Mexico during that time, while Ford is at seven per cent. That compares with 82 per cent for Ford in the U.S. and 61 per cent for GM. "Their production decisions are about greed not industry trends," states the video. "GM and Ford both face the same industry trends, but Ford has made different choices." WardsAuto did not immediately respond to confirm the data cited by the UAW. The UAW's social media efforts are in addition to more aggressive pressure from Canadian union Unifor, which is fighting GM's plans to close its assembly plant in Oshawa, Ontario. This month Unifor launched a national advertising campaign against GM and a boycott of its Mexican-made vehicles. The union also set up a two-day blockade of GM's Canadian headquarters near Oshawa, forcing GM salaried employees to work from home. Unifor President Jerry Dias said union plans to spend millions of dollars on its cross-border advertising campaign in Canada and the U.S., consisting of high-profile time slots on TV, as well as ad buys in newspapers and radio. The union has started a social media campaign called #SaveOshawaGM. UAW Local 1112, which represents Lordstown Assembly in Ohio, partnered with the Youngstown-Warren Regional Chamber of Commerce for a campaign called "Drive it Home" to persuade GM to increase its investment in the plant, rather than shut it down. GM has said two U.S. assembly plants — Lordstown Assembly in Ohio and Detroit-Hamtramck in Michigan — have not been allocated new product. Powertrain plants in Warren, Mich., and Baltimore don't have products assigned after this year. Plants don't necessarily close when they have no new products scheduled, but the moves put their future and jobs at risk heading into this year's contract negotiations with the UAW. The current contract expires in September. UAW President Gary Jones appears in one of the videos. "GM is committed to maintaining a strong manufacturing presence in the U.S., as evidenced by our more than US$22 billion investments in U.S. operations since 2009 and more to come this year. For example, we have invested more than US$4 billion to support full-size trucks and SUVs in Michigan, Indiana and Texas. "The November 26 announcement supports our ability to invest for future growth and positions the company for long-term success, maintaining and growing American jobs." GM CEO Mary Barra on Monday once again defended the company's decisions, which was met with mixed reactions online — from praise and understanding to calls for her firing and company boycotts. "We are a large company with significant but not infinite resources. We have to make smart, strategic — and sometimes difficult decisions about where to invest," she wrote in a post on LinkedIn.